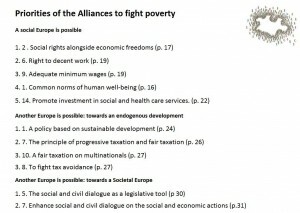 The “Alliances to fight poverty” organised a conference to present their “Call for a social, democratic and sustainable Europe”. More than 80 guests listened to prof Richard Wilkinson, 6 social organisations, 4 European Political parties. They had also the task to vote for our proposals. we should increase equality by extending democracy into economic sphere. and Patrick De Bucquois, president of Social Services Europe, moderated by Jamie Burton, president of Just fair, UK. They were asked to choose their top 3 proposals from our Call. Pierre Defraigne asked for a reinvention of full employment. Peter Kelly has choosen al the measures who tackle the income inequality. Claire Roumet stressed the necessary revitalisation of European democracy by an enlarged civil and social dialogue. Ronald Janssen asked an investment of the rich European countries in the countries with a severe deficit. Patrick De Bucquois choosed the proposals on the human rights and social rights. Mahmood Messkoob asked for a market with a social soul. Jeremy Leaman stressed the importance of the reduction of market inequalities by fair taxation. A debate with the public enlarged the vision of a social Europe. We started the afternoon with a small speakerscorner with Klaus Sambor from Basic Income Initiative, Luigi Leonori from SMES, Paul Murphy, MEP from Ireland and Maria Domingos from EAPN Portugal. The audience had the opportunity to choose between all our proposals. On this picture you see the chosen proposals. Social rights, decent work, an enriched definition of human well-being, social investment, fair taxation in all its forms, a sustainable development and an enhanced social and civil dialogue. With these and other proposals we have invited the MEP’s to choose their top 3 proposals. The objective of the conference was to present our Call, to look for support for our proposals. As Claire Roumet said, there is a great similarity between this Call and the memorandum of the Spring Alliance. This means for her that these proposals haven’t been built in Brussels ivory towers, but has been developed bottom-up there where people experiencing poverty and there where workers fight for decent work. For Claire this means that we can build together a new vision, a picture of a better Europe. 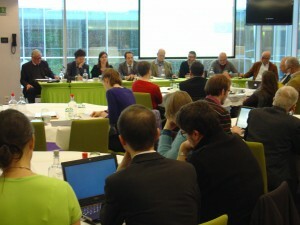 The conference made it clear that there is a large support for a social, democratic and sustainable Europe. This large support has to be translated into the European policy. Therefore we need the support of all to transform our society.